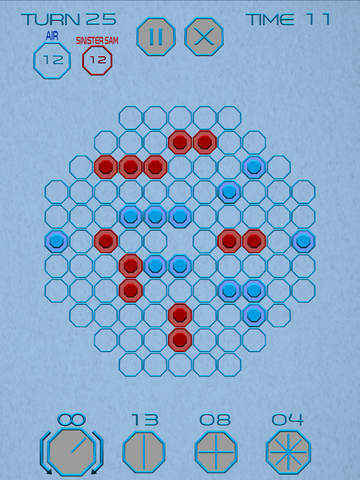 The Octagon Theory 3, recently released on Apple App Store, is a game that one must not miss to play. If you are a fan of Turn-Based strategy game, then this game will definitely excite you. “The Octagon Theory 3 is a completely original turn-based, strategy game that is played on an octagon-shaped board. It’s completely different from but also in the style of board games like Othello (Reversi), Checkers, and Chess.” – By M&D Enterprise Ltd.
TOT 3 (The Octagon Theory 3) has both single player and multiplayer mode. In Single player mode, players plays one on one against computer. The fun increases when played in multiplayer mode. In multiplayer mode, players can play up to 3 players against them. TOT 3 has 5 multiplayer boards. The game also features in-app chatting. The game is now live on App Store both for Mac and iOS.